Necktie Ninja: I already have an iPad (or other tablet); why should I buy an E-reader? I already have an iPad (or other tablet); why should I buy an E-reader? In college I had a lot of PDF's to read and the biggest problem with PDF’s is I had to read them on a computer....a computer that could play movies, surf the internet, play games, send & receive emails, edit videos, read news, play music and check up on my social network. I never got anything done in college because my PC did everything I wasn't supposed to be doing during homework time. The days I didn't bring my computer to school were some of my most productive days. Feel free to disagree with me if you are a multitasker extraordinaire but I know that for me and most people, we would never read more than 5 pages of a book on an iPad or a Kindle Fire without going to YouTube to watch Gangnam Style for the 199th time. The argument for tablets over E-readers is the multipurpose argument. People want their machine to do everything from reading to taking pictures. A few years back a friend of mine bought shoes that had a bottle opener built into one of the soles....neat idea I guess but who needs a bottle opener under their shoe? I just need my shoe to facilitate walking. Maybe it's because when I see something shiny I get distracted but I need a simple device for reading otherwise I won't read. For the same reason, I disagree with some people's complaint of the Kindle E-readers’ inferior web browser or the slow MP3 player. I haven't even looked for the MP3 player on my Kindle E-reader yet because I'm afraid once I find it, I'll stop reading after every 3 pages to go listen to my favorite Justin Bieber song. Before I continue, I do own an iPad and I LOVE IT! I’m just saying that my book reading has plummeted since I bought the iPad. Here’s a chart showing an exact count of the non-fiction books I read during the 10 months before and after my iPad purchase. Technology continues to get “better” every year. I put the word “better” in quotes because maybe there’s value in slowing things down a bit for some good old fashioned reading once in awhile. Maybe it’s ok that our shoes only cover our feet and don’t have the ability to transmit Morse Code to Mars. I wonder if I’m better off with my amazing iPad machine with the hundreds of apps that make my life so much “better”? I wonder what the comparison chart looks like that compares quality time spent with my kids before and after the iPad? If you already own a tablet and want to get into reading or want to simply just read more and watch less television, I HIGHLY recommend the Kindle E-readers. 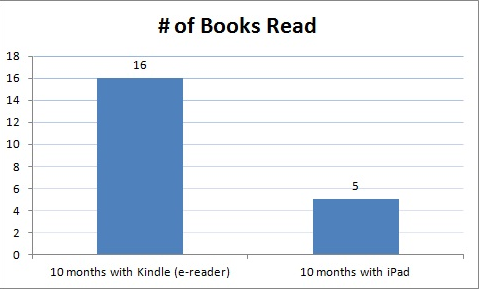 I have an iPad and a Kindle E-reader and love them both. I've included some links here for you to check them out for yourself. Read the reviews and pick the one best for you. Despite this disclosure statement, you can be sure that any recommended products or services I use personally and believe will add value to readers. I would not recommend anything I didn't personally use and believe in. For this reason, you will never see a recommendation from me to buy a Shake Weight®. What's in a (business) name?